Wild Times on Skidaway Island, Georgia’s Historic Rain Forest, gives the daily details of life in a unique Audubon-designated, ecologically friendly refuge that protects species refuge. There, golfers pitch balls around endangered great blue herons, and modern day residence watch mama raccoons march their babies across backyard decks where once Guale Indians trapped ancestors of the same raccoons. This is the subtropical south: all is not furry marsh bunnies and deer. Residents dodge alligators and rescue snakes from deer-netting, (after a sufficient number of cocktails). SKU: SM21040. Category: Nature. Tags: ecology, Georgia, nature, rain forest. Even the vegetation is wild. Landscaping covenants protect native species and prohibit manicured lawns. Three hundred-year-old oaks dripping Spanish moss and poison ivy surmount an under-story of wax myrtle and holly. Yellow-blossomed Carolina jasmine, Cherokee roses, and endangered orchids grow wild in the rain forest. This book examines choices residents make when stared down by a bald eagle, when a red-tailed hawk mistakes a golf ball for bird food, when wakened at midnight by deer munching hibiscus, newly planted in pots on a wooden deck. Wild Times on Skidaway Island also educates about the species that residents must adapt to on this historic island. 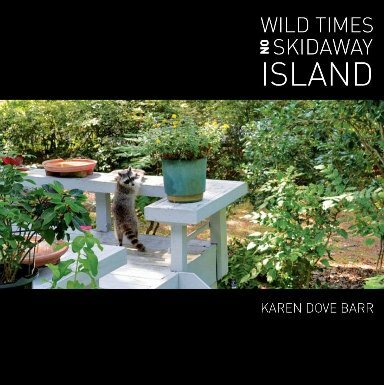 “Karen Dove Barr’s vivid storytelling about the flora, fauna, and assorted wildlife on Skidaway Island brings the reader as close to nature as if they were out camping. But luckily there is no hard ground, smoky fire, or insect bites involved. Just a series of entertaining and informative vignettes about the abundant nature bounty on this glorious island.” ~ Joel Zuckerman, author of seven books on golf, including a book of the year award winner. Karen Dove Barr is a lawyer who has lived on Skidaway Island since 1989. She is a native Georgian with a B.A. from Mercer University and a J.D. from John Marshall Law School. Karen is the author of Running through Menopause about becoming a long-distance runner at age fifty. Her essays have appeared in Runners World, Fitness Magazine, Dog Fancy, Coastal Senior, and Savannah Magazine, and she has been a columnist for several local publications. Dawn Again takes readers along on Doniga s journey: the wilderness immersion school where Indigenous elders and wildlife trackers were among her teachers, hitchhiking across the pacific northwest, the moment she first connected with a deer using owl eyes and fox walking techniques, and to Alaska where she fell in love with tracking white wolves and the rigor of wilderness survival. In Movement Matters, Biomechanist, Katy Bowman, continues her groundbreaking investigation our sedentary culture and the mechanics behind it. She unveils the profound potential of human movement. Movement Matters is a collection of essays where Katy widens her You are how you move message and invites us to consider our personal relationship with sedentarism, privilege, and nature.